Kris Kringle has a special delivery for you! Detailed sculpture features Santa Claus with a hand truck that's stacked with Coke. This fun table piece stands about 10 1/2-inches tall. Use it as a centerpiece for your next holiday party! Kris Kringle has a special delivery for you, and he'll set it down right on your table for all to see! This amazingly detailed sculpture features Santa Claus in his trademark red suit with a bottle of Coke in one hand and a hand truck stacked with cases of the popular beverage. 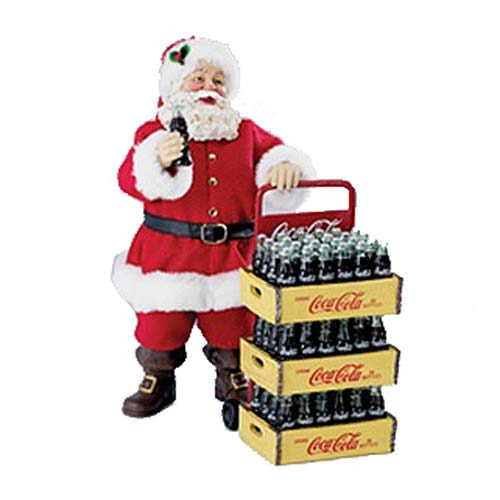 If you can't live without your Coke, you probably can't live without this Coca-Cola Santa with Delivery Cart 10 1/2-Inch Table Piece either!